It is known as Batman's Alley and on Google Maps it looks like any of the hundreds of narrow inner streets that twist and turn within Sao Paulo's blocks. What makes it different and cannot be seen from above is that every single wall in its 100m extension is covered top-to-bottom with graffiti of all shapes and colours. The graffiti here are not the average large-letter tags, although there is a lot of that. Batman's Alley or Beco do Batman, in Portuguese, resembles more an open-air street art gallery, where abstract, surreal, psychedelic and geometric paintings colourfully co-exist. You only need to drive for a few blocks in Brazil's biggest city to encounter its thriving graffiti culture. It is the most visible expression of a new, creative, buzzing Sao Paulo that has emerged in the last 10 years. A vast and diverse network of musicians, playwrights, film-makers, painters, cartoonists, actors, singers, DJs, writers, poets, dancers, architects and fashion designers have not only been busy producing work but are also helping to lend 21st Century Sao Paulo a cosmopolitan, artistic edge which is unprecedented. "Foreigners use the word 'energy' a lot to describe Sao Paulo," says Baixo Ribeiro, who along with his wife Mariana Martins, has fostered and promoted urban and street artists since 2003 through their gallery Choque Cultural. "They say they feel a vibe which is different to other places. It has a lot to do with the zeitgeist: Brazil and other countries which were always secondary but that are now emerging strongly." Baixo and Mariana's gallery is a true pioneer in Brazilian art. They were the first in the country to tap into new urban art forms such as graffiti, stickers, posters and tattoos and place them in a gallery where they could earn critical respect, reach a wider audience and be commercialised. Last December, Sao Paulo's Paulista Avenue hosted a watershed moment. Draped over the modernist concrete and glass block that is Sao Paulo's MASP art museum, home to Van Gogh and Monet paintings, was a huge banner announcing an exhibition with several of the city's graffiti artists, curated by Choque Cultural. "MASP invited us to bring our work to a larger audience. The six participating artists created an environment with a lot of visual 'volume', with nearly 100% of the place painted with massive doses of spray can, acrylic and other materials," explains Baixo. The exhibit was a success, with 135,000 visitors in 10 weeks. 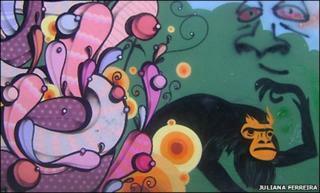 Brazilian urban art has travelled much further though. Osgemeos (literally, the twins), two brothers from Sao Paulo's northside, are to Brazil what Banksy is to the UK: street artists who have become household names. They have displayed their work at the Tate Modern in London (alongside fellow Brazilian artist Nunca), customising the museum's facade. Osgemeos have also taken their work to Japan, the US, Greece, Spain, Switzerland, Italy and Cuba. "What's going on has a lot to do with the city's entrepreneurial spirit," says Alexandre Youssef, one of the owners of Studio SP club, a key venue for a whole new live music scene. "In previous decades, it had to do mainly with industry, then services. Now it is visible in the creative industry," he says. Mr Youssef is also involved in politics: he is running for a seat in the national Congress in this year's elections. His platform is the development of the creative industry in Sao Paulo, which he says has had very little support from local authorities. Decorated with fine examples of urban art (including a painting by Osgemeos), Studio SP has hip music-lovers lining up every week to enjoy a vast array of music: rock, dub, new Brazilian pop, folk, electronic. "There has been an explosion of live, authorial music over here, with artists like Mallu Magalhaes, Curumim, Cibele, 3 na Massa," says Youssef. One artist who Studio SP helped to launch was Sao Paulo-born Ceu. The delicate-voiced singer went on to become the most important names of a new generation of Brazilian female singers. Ceu has been praised in US publications such as Spin and Rolling Stone. She has toured extensively abroad, playing in major events such as the North Sea Festival in Holland, and Coachella in the US. Studio SP is located in a central area known as Baixo Augusta. Only five years ago, it was mainly gawdy strip joints, transvestite salons and dilapidated buildings. These are all still there, but they have been joined since by dozens of trendy clubs, bars and live venues, making Baixo Augusta Sao Paulo's answer to London's Shoreditch. By transforming areas such as Baixo Augusta, Sao Paulo's cultural boom is also helping to revitalise once run-down areas in the city's central area. Another good example of this is nearby Plaza Roosevelt, once an almost derelict area, now a hub of alternative theatre, dotted with bars and small theatrical venues. However, as Rodolfo Vazquez, a director at the Satyros company, explains, revitalisation does not have to mean gentrification. "We never wanted to expel the transvestites and drug dealers which dominated the area. On the contrary, we try to integrate them, understand their problems and their social habits. We have even managed to bring some into the group's plays." "Sao Paulo is one of the coolest cities in the world right now. As it is relatively far from the world's main metropolises, the culture has developed on its own terms," say Laima Leyton and Iggor Cavalera who together deejay and produce electronic music under the name Mixhell. Cavalera reached global fame as the drummer of Brazilian heavy metal band Sepultura. Some years ago he turned his attention to dance music and formed Mixhell with his wife Laima. With a busy diary of gigs abroad, they will play the Glastonbury music festival in the UK this year. Mixhell are one of many acts to emerge from Sao Paulo's vibrant clubbing scene and gain international prominence. Others include DJ Marky, who had a UK chart hit with LK back in 2003, and Gui Boratto, who is signed to German label Kompakt and has remixed Goldfrapp and the Pet Shop Boys. "Sao Paulo is a very dynamic place, where different cultures meet," say Iggor and Laima. The melting pot aspect is also highlighted by Youssef. "People from all over Brazil come here. The city tends to attract enterprising, creative people, who come after an environment where they can make things happen. Sao Paulo is open to everyone."